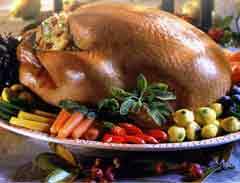 Some of the common breeds of turkey in the United States are the Bronze, Narragansett, White Holland, and Bourbon Red. Though there is no real evidence that turkey was served at the Pilgrim's first thanksgiving, but through ages it became an indispensable part of the Thanksgiving tradition. The tradition of turkey is rooted in the 'History Of Plymouth Plantation', written by William Bradford some 22 years after the actual celebration. Unfortunately the Bradford document was lost after being taken away by the British during the War of Independence. Later it was rediscovered in 1854. And since then turkey turned out to be a popular symbol of the Thanksgiving Day. And today of all the the Thanksgiving symbols it has become the most well known. The turkey has brown features with buff-colored feathers on the tips of the wing and on the tail. The male turkey is called a 'tom'. It is bigger and brighter with more colorful plumage. Also it has a long wattle (a fleshy, wrinkled, brightly colored fold of skin hanging from the neck or throat) at the base of its bill and additional wattles on the neck, as well as a prominent tuft of bristles resembling a beard projecting downward from its chest. The female is called a 'hen' and is generally smaller and drab in color.